Butterfly is an iPod speaker dock that allows users to listen their favorite songs while charging the device. The stylist iPod speaker dock consists of two speakers at the top and an iPod docking station in the middle which holds most iPod models. Featured with LED volume indicators, Butterfly is also equipped with an auxiliary-in jack that enables users to connect non-docking iPods, MP3 players and etc. It also has built-in USB port that able to synchronize with desktop. In addition, it able to support AV output. The dock can also support power by four AA batteries and with battery saving automatic shut-off feature. Includes universal dock for iPod. Compatible with all docking iPod’s. Charges most dockable iPod models*. AC or battery powered (4 AA batteries not included). Auxiliary-in jack to connect non-docking iPod, CD players, and other MP3 players. Audio or Video output jack. USB port for synchronizing with desktop. 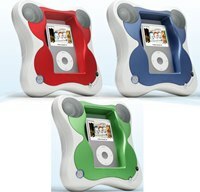 Includes dock connectors for iPod mini, iPod nano (1st generation), iPod nano (2nd generation) and iPod with color display. Butterfly is available at vesta-shop.com with three colors, red, blue and green for the price of $80.